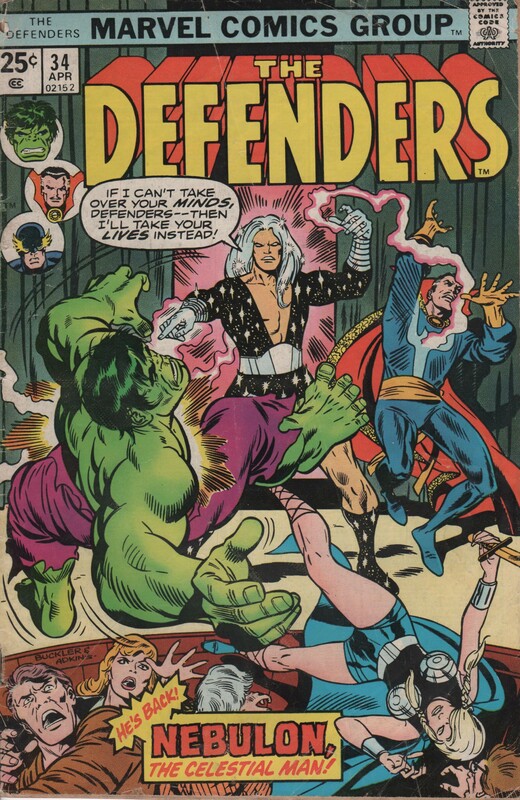 The Defenders #34, 1976. “He’s Back! Nebulon, The Celestial Man” | Magazines and Monsters! Being a huge fan of Dr. Strange, this title is obviously on my radar. The issues written by the eccentric Steve Gerber, were crazy, but so good. In this particular issue, a powerful enemy, Nebulon, has returned, and it’s up to the Doc, Hulk, and Valkyrie to take him down! Written by Steve Gerber, art by Sal Buscema & Jim Mooney, and letters by Irv Watanabe, and colors by Irene Vartanoff! And what an awesome cover by Rich Buckler & Dan Adkins! Enjoy! Funnily enough I was just looking at the Doc Strange / SHIELD comic he originally appeared in (I think) – 1967. The Doc first appeared in Strange Tales #110, 1963. I have it in a B&W trade (Marvel Essentials), but not the original. My pockets aren’t deep enough…yet! Back in those days, Marvel lost their distributor, so they had to go to DC for distribution. The deal they made only allowed 8 titles a month (I think) to be published. Marvel decided to split books like Strange Tales, and Tales to Astonish in half, so they could get more characters out there for the readers. I didn’t know that – I meant I think it was Nebulon’s first appearance. I inherited a treasure trove of bound Marvels and DC’s from 67 – 72 (roughly) recently, all the New Gods titles, Kull, The Demon, Strange tales etc. It’s almost all too much to take in. Wow, that’s some great stuff you inherited! Sounds like you’ll be reading for a while! Nebulon first appeared in Defenders #13, 1974. He was a cool character, but Marvel pretty much just used him as a throw-a-way.